Edgardo Miranda-Rodriguez was raised in the Bronx, speaking very little Spanish and knowing very little about his motherland. He was already 13 years old when he first stepped foot on the island of Puerto Rico, with his mother and little sister. Understandably he found this transition to very difficult, between his mothers failed attempt at reuniting with his sister’s father and the judgment his extended family placed on him for being a Nuyorican outsider. It wasn’t until he stayed with an uncle in Ceiba, a northeastern municipality stretching from the easternmost edges of the El Yunque rainforest to the Atlantic coast, that he truly connected with Puerto Rico: His Tío Joaquin showed him the importance of the island’s autonomy in his backyard, where he grew mangoes, breadfruit, and avocados. Back on the island again this past Sunday—now a 48-year-old, critically lauded graphic novelist—was an altogether new experience. 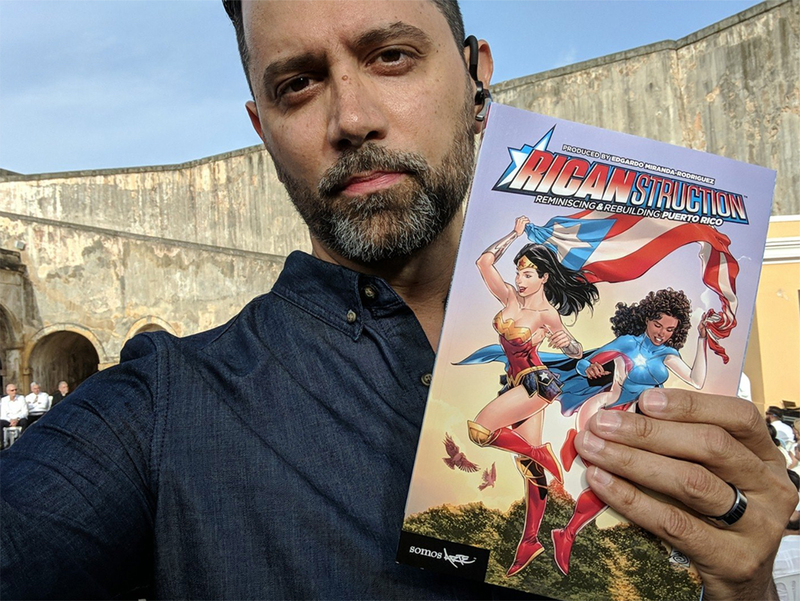 It wasn’t his first return, of course; he’d visited as recently as May for Puerto Rico Comic Con, where he debuted the comics anthology Ricanstruction: Reminiscing and Rebuilding Puerto Rico. Now, however, Miranda-Rodriguez was there to award grants made possible by its sales to nine grassroots organizations working in the island’s recovery—groups that will be key in shaping its sustainable future. 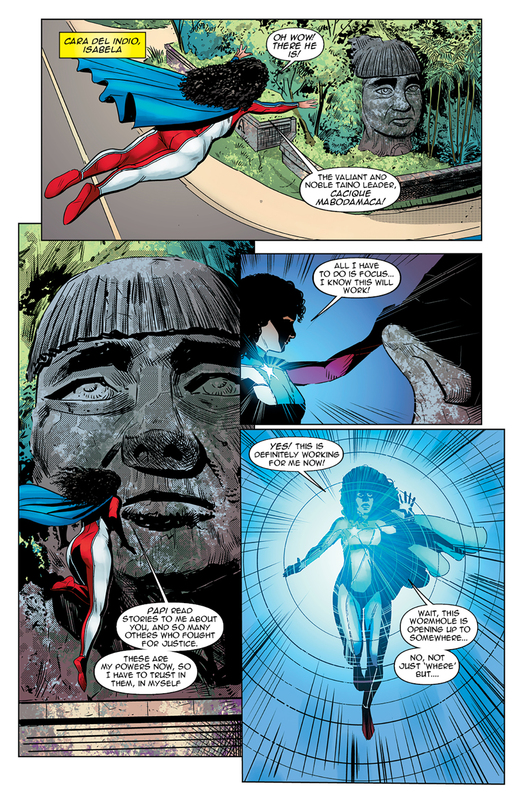 Contributors to Ricanstruction include comic book industry greats as well as Puerto Rican and Latinx public figures, and several stories weave in classic superheroes like Wonder Woman, Batman, Superman, and The Flash into stories featuring La Borinqueña, Miranda-Rodriguez’s original superhero. 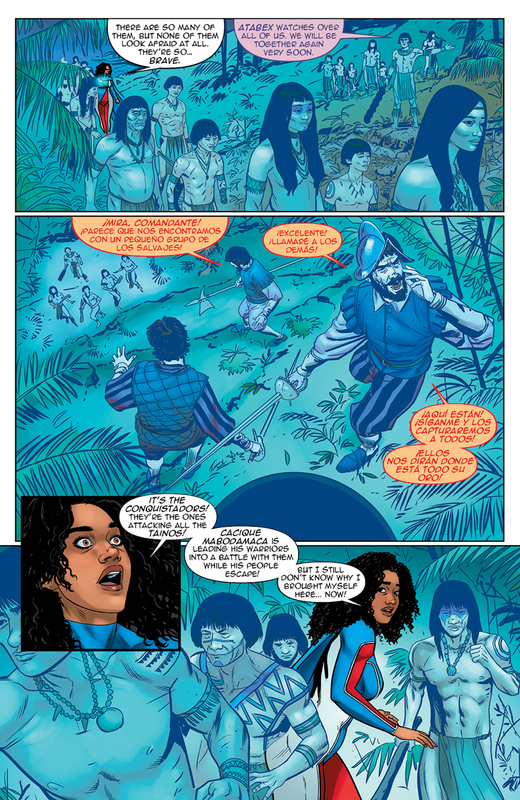 But the anthology also explores facets of DiaspoRican upbringings, of balancing heritage with identity, along with tales of struggle and resilience in the post-Maria crisis. There’s history, too: References to the migration wave of the 1950s, the devastation of hurricanes San Felipe and San Ciprián in 1928 and 1932, the economic hindrance of the Jones Act, the indigenous Taínos who populated the island long before Christopher Columbus ever intruded. The event coincided with the 150th anniversary of el Grito de Lares, a historic uprising against the Spanish in the name of Puerto Rico’s independence. 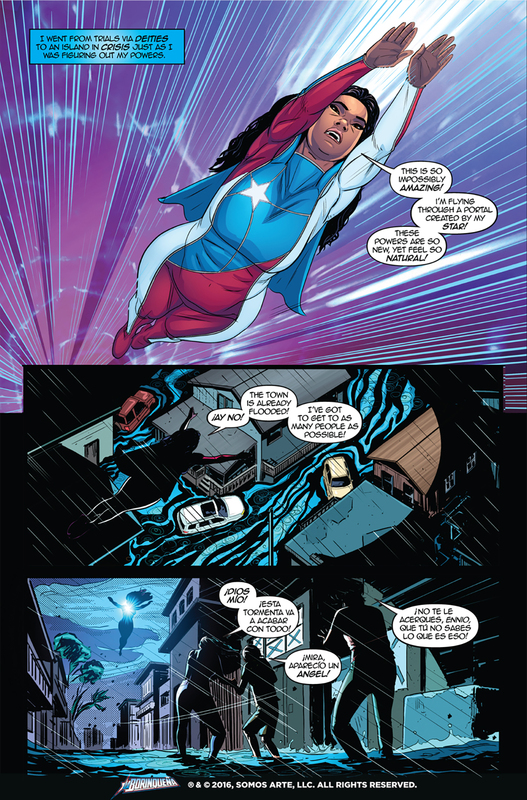 That feels more fated than happenstance: It’s a scrap of fabric from the original Grito de Lares flag sewn by Mariana Bracetti that transforms Marisol into La Borinqueña. He made reference to that before the organization leaders, almost all of them women—a testament to the crucial role women have always played in Puerto Rico’s resistance. 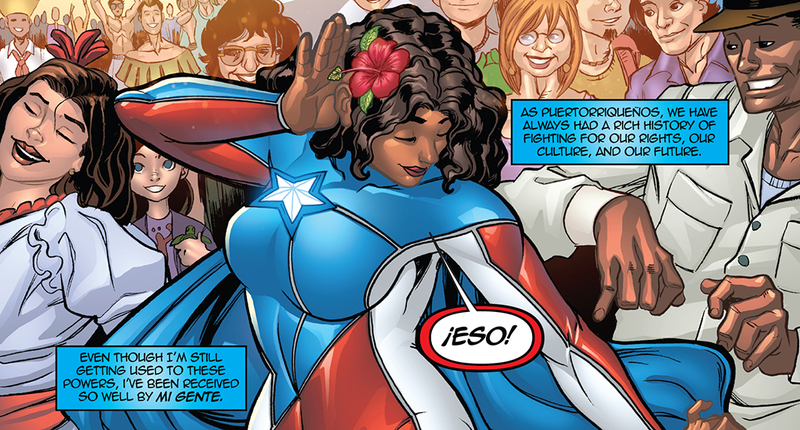 In part, La Borinqueña represents that strength. Marisol’s journey, however, mirrors a mind-opening: We see the evolution of her political consciousness, which in turn supports her mission as a superhero. Where Marisol stands in latest issue is neither explicitly pro-independence or statehood; she’s an Earth and Environmental Sciences undergrad at Columbia University, and Miranda-Rodriguez chose to show her political education in real time. 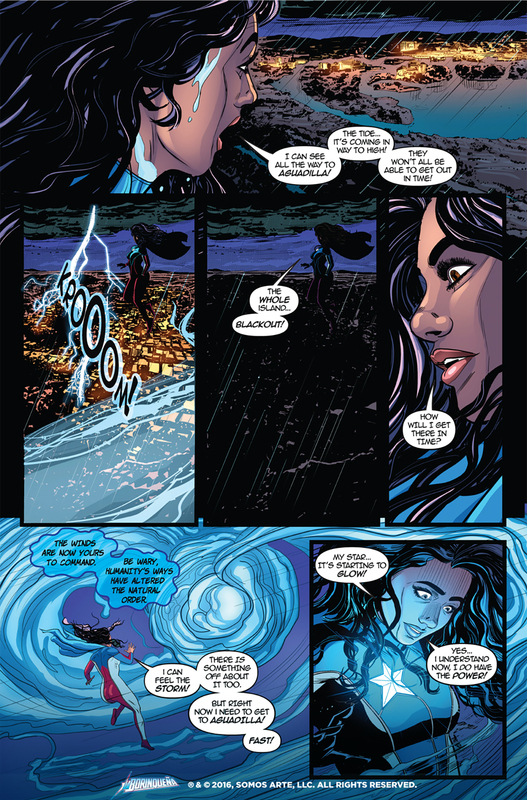 The education offered to readers is far-reaching: In how Marisol gets her powers, there is Taíno mythology; allusions to issues of colorism in Latinx culture are made; there are mentions of municipal cutbacks and other real-life austerity measures implemented by the island’s government and the U.S.-appointed management board that now oversees all of Puerto Rico’s finances; there is criticism of FEMA, too. Miranda-Rodriguez’s own political education came by way of Iris Morales, an original Young Lords activist during the late ‘60s into the mid-’70s. During his college years, she mentored him for an entire summer. His commitment to learning Puerto Rico’s history and its social movements is an ongoing one—it goes beyond his time with Morales or his sociology and anthropology studies. He’s perpetually learning; he sees trends. 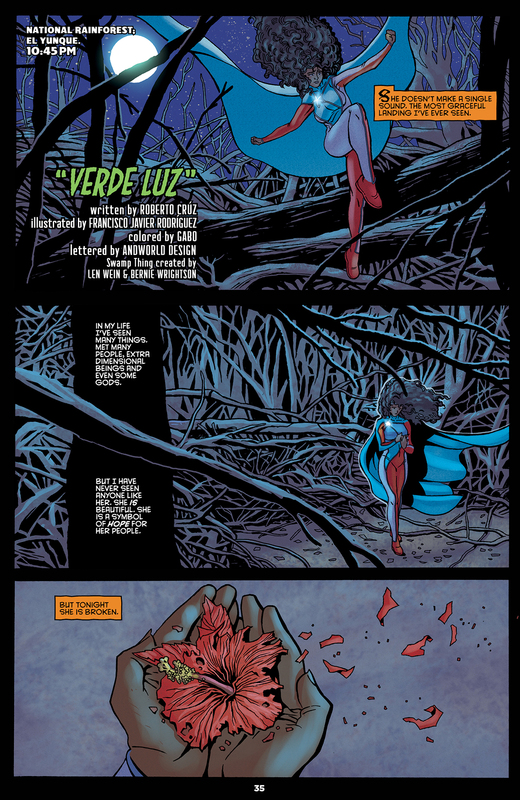 The electrical blackout at the stormy end of the inaugural La Borinqueña issue was written nine months before María rendered the entirety of Puerto Rico dark. The follow-up issue included a student protest that culminates in police violence, not unlike what occurred during the island’s May 1 National Strike this year. He wrote that, too, before it actually happened. Neither event is a complete anomaly; Puerto Rico has historically resisted colonialism and its own government’s policies and corruptions. Tropes like evil corporations and government conspiracies aren’t total hyperbole, Miranda-Rodriguez says. Exploitative economic policies, unethical birth control testing, forced sterilizations, 60-plus years of bombing drills that decimated the outlier island of Vieques and left its people sick, the Gag Law of 1948 that for nine years made illegal all acts patriotism, like singing “La Borinqueña,” waving a flag, or even speaking of independence—these are all realities for Puerto Rico. That La Borinqueña is rich with culture—iconic dishes like sancocho, the chirping coqui frogs, the majestic ceiba tree, the rhythms and dance of bomba y plena—assures the narrative is grounded in the familiar, in what’s beloved and genuine. Miranda-Rodriguez wants Puerto Rican readers to feel represented. But reminders of the people’s storied resistance serve as tribute too, and the fact-based examples—like issue two’s proposed razing of a beach in Playuela to build a resort—help readers understand where la lucha stands now. For Miranda-Rodriguez, the Ricanstruction grant ceremony was an affirmation of the continued strength of that resistance. His wife, Kyung Jeon-Miranda, his best friend, his older brother, and his sister-in-law were all part of the process, and ultimately, the decision was made that all organizations that applied would receive a grant—if not now, then in a subsequent round. The grassroots movement is what “keeps this island alive, that is literally the blood going through the veins of this island.” He is hopeful for the island’s future.